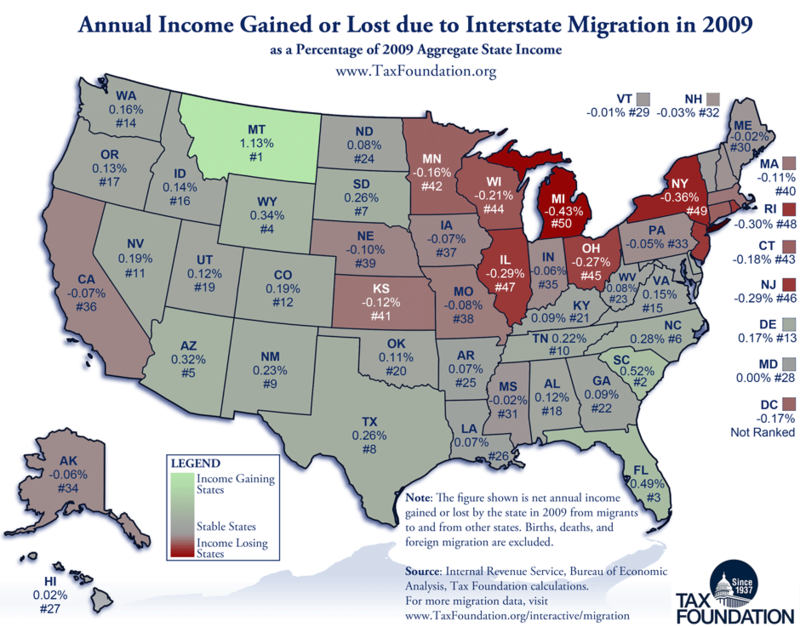 This week’s map takes advantage of new migration data recently released by the IRS. It shows, for the year 2009, the net annual income of all migrants to and from each state to other states, as a percentage of that state’s aggregate income. (Foreign migration is deliberately excluded.) At the top of the list is Montana, where migrants, in a single year, brought with them a net income totaling more than 1% of the state’s entire annual income. At the bottom is Michigan, where migrants leaving the state took with them 0.43% of Michigan’s entire annual income. This data partly comes from our interactive State-by-State Migration Calculator, which has just been updated with the most recent 2009-2010 migration data. Second Note: Last week I posted a map of effective tax rate by zip code and mentioned that I’d try to have a similar map this week that controls for income. I’m still trying out a variety of different methods, so that map has been pushed back.